Not Washable (too big to fit into machine)100% Organic Cotton Fabric Hand made in Oakville, WA by Holy Lamb Organics. Since wool is the most breathable of all bedding materials, your body will love sleeping on top of our organic wool mattress toppers. If you have a synthetic mattress, creating a natural sleeping surface is the best thing you can do for your body. We hand craft our organic wool toppers using Premium Eco-Wool batting tufted between 2 layers of organic cotton fabric. 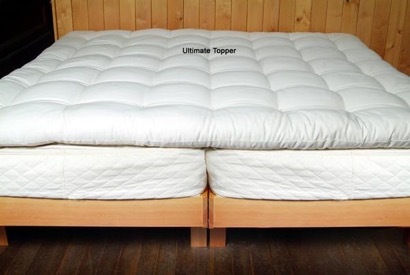 Designed to lay flat on top of the mattress without shifting. Choose the right thickness depending on how much loft you prefer. We guarantee that you will enjoy this wonderful addition to your bed. Deep sleep wool topper: This is a perfect choice for adding just a little more softness to your mattress, but not the full loft of The Ultimate Wool Topper. Hand tufted.